how can i find out if i have a previously undiagnosed cardiac condition? There are a number of different assessments that doctors can use to test your heart for cardiac conditions. The main two types of assessment used for screening are an electrocardiogram (ECG) and an echocardiogram. Most cardiac conditions can be diagnosed by using a basic ECG test. The NHS website (www.nhs.uk) explains: "An ECG is a simple test that can be used to check your heart’s rhythm and electrical activity. Sensors attached to the skin are used to detect the electrical signals produced by your heart each time it beats. These signals are recorded by a machine and are looked at by a doctor to see if they’re unusual". An ECG is a non-invasive test, it is pain free and doesn’t cause any pain or side effects. Small sticky sensors are placed on your chest, arms and legs which are connected with wires to the ECG machine. If the results of an ECG are unusual a doctor would normally recommend a patient having an echocardiogram. The NHS website (www.nhs.uk) explains "an echocardiogram or 'echo' is a scan used to look at the heart and nearby blood vessels. Its a type of ultrasound scan, which means a small probe is used to send out high-frequency sound waves that create echoes when they bounce off different parts of the body. These echoes are picked up by the probe and turned into a moving image that's displayed on a monitor while the scan is carried out." An echocardiogram is also a non-invasive test, that is painless and has no side effects. 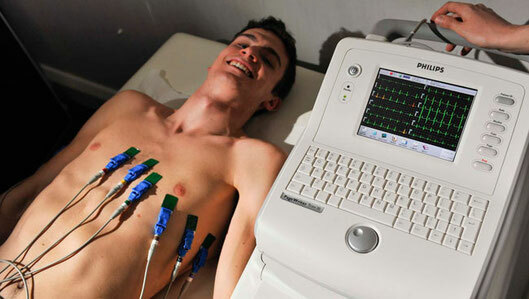 Similar to an ECG, you will have small sticky sensors stuck to your chest, called electrodes. The person conducting the test will also apply some lubricating gel to the area of your chest where they are using the probe. Where can I have an ECG or echocardiogram? Unfortunately ECGs are not routinely offered on the NHS unless you have cardiac symptoms such as breathlessness, chest pain, blackouts or a family history of inherited cardiac conditions. In our opinion, it is definitely still worth asking your GP if you can have an ECG though, as individual surgeries do sometimes offer them when requested without these symptoms. ECGs are available from private hospitals but do have quite a high cost, on average about £100. Some large charitable organisations offer heavily subsidised screening sessions, such as Cardiac Risk in the Young (CRY). These are normally free for the public to attend.